So you've done your research and finally narrowed it down to two mattress, but can't decide which one to go with? Let us give you a hand. Our team dug extra deep to bring you this side by side comparison of two of our favorite brands. Both Puffy and Nectar have thousands of reviews on their sites. As you can see from the bar graphs, the large majority of them are five star reviews. Click the underlined links below to read more. Both the Puffy and Nectar Mattresses are made from high quality materials. Both use environmentally friendly CertiPUR-US certified foams, which are much better for the environment and for your health. The manufacturing process of traditional foams can cause mattresses to be contaminated by dangerous chemicals such as formaldehyde and heavy metals like mercury and lead. CertiPUR-US foams are not exposed to any harmful substances. Both companies are relatively young, so long term durability has not been tested, but since both mattresses are made with quality materials and offer a lifetime warranty, we don't expect durability to be a problem. Puffy uses two layers in their mattress, compared to Nectar's four. The Puffy layers are thicker than Nectar's however, so their total mattress thickness ends up being 10" which is only one inch less than Nectar. Puffy's top layer is made from their patent pending gel infused foam which they call the "Cooling Cloud". This 4" thick, advanced foam layer uses convection and conduction technology to disperse heat away from your body. It increases airflow 8x more than a standard memory foam mattress and Puffy gets great ratings for their cool sleep experience. Their base layer is built from firm core support foam, making it comfortable, strong, and durable. This layer is 6" thick and uses Insta-Firm Technology to give 99% better responsiveness and four times the support of a normal mattress. Puffy covers all this with a super soft and breathable stretch-knit cover. The cover unzips and is easily removable for washing. Nectar's mattress is comprised of four layers. Their 1" top layer is made from quilted gel memory foam. It is designed to contour to your body as well as to provide loft and increased air circulation. The second layer is 3" of regular gel memory foam. This foam helps to evenly distribute your weight and to provide cooling support. 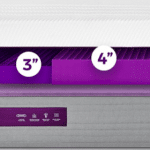 Layer three is an adaptive hi core memory foam and is 1/2" thick. This is the layer that keeps you from sinking too far into your mattress. It also helps the mattress to contour to your pressure points, and Nectar claims to be the only company in the industry that is using it. Underneath it all is a breathable base layer. It is a super dense foam that has special channels molded into it to improve air circulation throughout the mattress. It is one of the most dense foams on the market and is the main reason Nectar is comfortable offering their forever warranty. Nectar covers their mattress with a special TENCEL cooling cover. This cover is made from high-tech, moisture-wicking fibers, that are more absorbent than cotton, softer than silk, and cooler than linen. It is very breathe-able and helps to provide a nice cool sleep. There are three basic sleeping positions, back. belly, and side. Some people only sleep in one position and some people switch back and forth throughout the night. Most mattresses are better suited to one type of position than another, depending on the firmness of the mattress and what it is made out of. The Puffy mattress is excellent for light to average weight side, back and stomach sleepers. It may not be as comfortable for heavier sleepers(230 + lbs), as the foams may not be dense enough to provide the support that they need. The Nectar is excellent for light and average weight sleepers of all sleeping styles. For heavier sleepers, the Nectar is going to be one of the most supportive memory foam mattresses out there, especially if you sleep on your back. Both mattresses are very good at isolating motion, which means that if you sleep with someone who moves around a lot, you won't be disturbed. The Puffy does have a slight edge over the Nectar in this area.